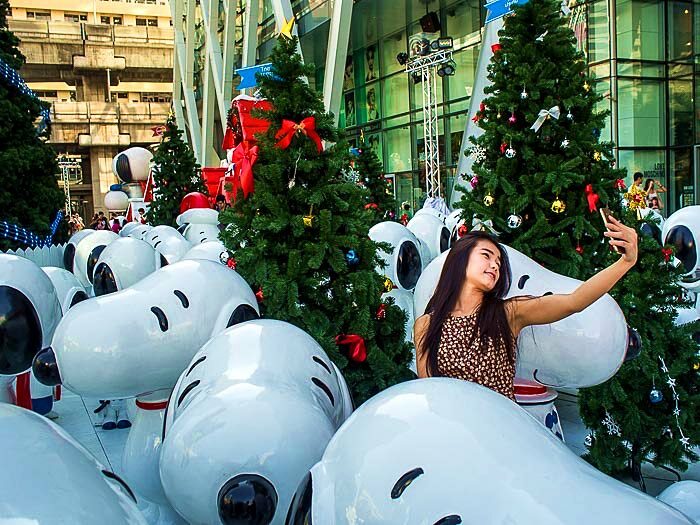 A woman takes a "selfie" in Snoopy's winter wonderland Christmas extravaganza at Central World, a large shopping mall in Bangkok. 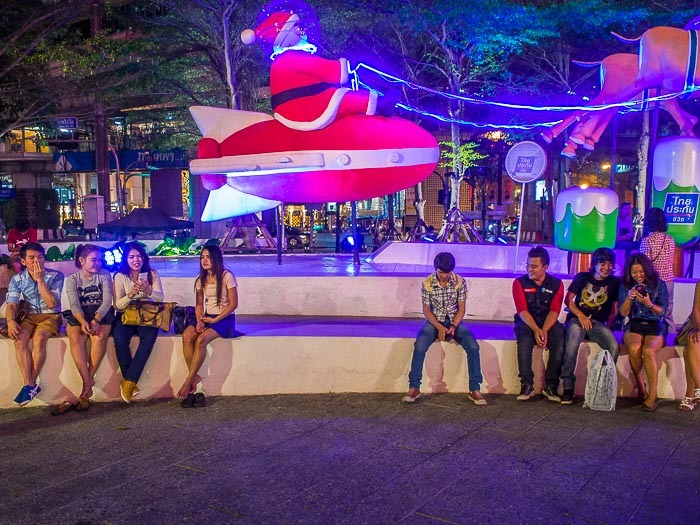 Bangkok comes alive in the Christmas season. The halls of the malls are decked out with boughs of (fake) holly. Santa hats are for sale in every intersection. Lights are strung, trees (also fake) popup in front of many businesses, not just the stores and that attract tourists but also hospitals, insurance companies and local markets. 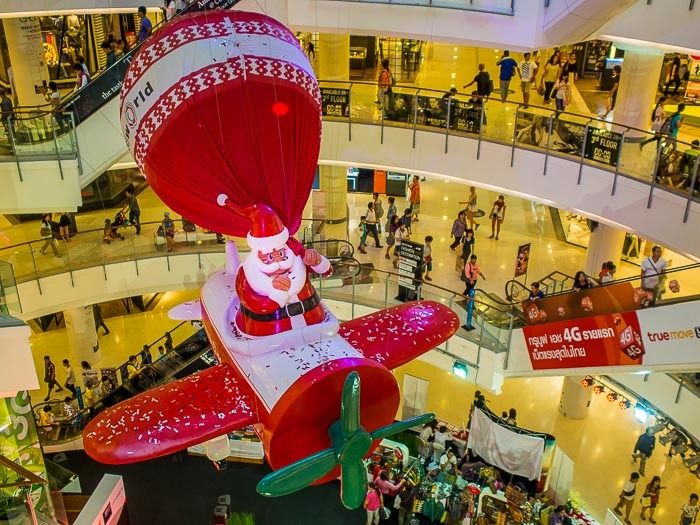 The Santa display in Central World. It amuses me when bloviators and pundits in the US decry the "War on Christmas." There is no war on Christmas. Bangkok is a very diverse city. Most of the people who live here are Buddhists, but there is no religious persecution to speak of and Christians, Muslims, Hindus, Jews and others are allowed to practice their faiths freely. 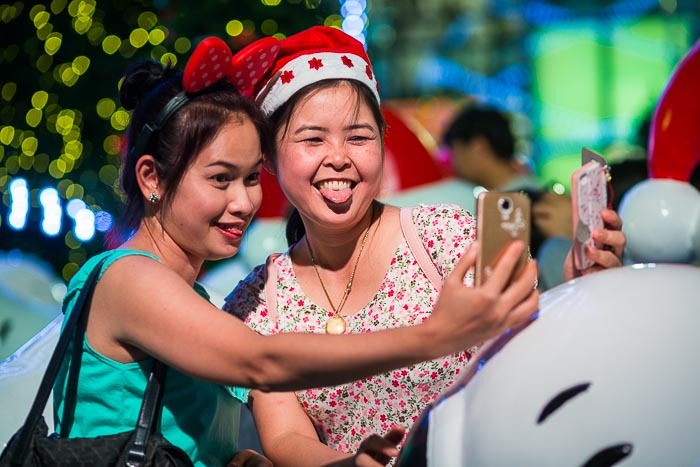 Muslims make up the second largest percentage of people in Bangkok, but Muslim holidays are not celebrated with anything approaching the same public displays that Christmas gets. 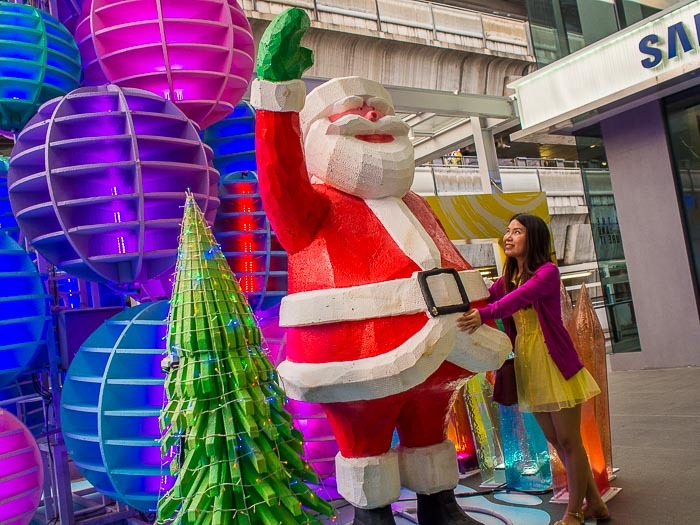 A Thai woman hugs a Santa Claus at a new mall in central Bangkok. Christmas here is surreal. Thais bundle up in faux Santa Christmasy clothing and go down to the Christmas displays to take pictures of themselves as though they were at the North Pole or some other suitably Christmas destination. Mrs Claus hasn't worn something like this in years. Selfies with a Santa hat. I can't help but think it must be difficult for non Christians at this time of year in Bangkok (or anywhere else really). Although there's an active Christian community (mostly Catholic) in Bangkok, there are many, many more Muslims and Hindus in Bangkok. Their holidays aren't celebrated with any of the vigor that Christmas is. Santa gets ready to blast off for his round the world toy distribution binge. So have yourself a Merry Little Christmas and the next time you hear there's a "War on Christmas" think about how prevalent the celebration of the day is, not just in the US but around the world. For your Christmas listening, "Little Drummer Boy" sung in Khmer by Dengue Fever, one of my favorite bands.